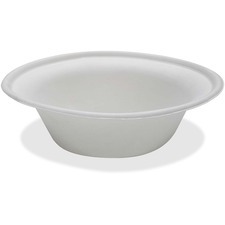 Disposable bowls provide a fast, simple way to clean up after any meal. Strong material is durably constructed to prevent bending during use. Eco-friendly design offers a responsible solution for your everyday dining needs. Plates are perfect for breakrooms, special events, office lunches and more. Made of sugarcane, these compostable bowls are BPI certified and ASTM D6868 compliant.